This year marked the 30th Annual George Peabody Essay Contest. Third grade students throughout our city were asked to reflect on how they would change the world as a philanthropist like George Peabody. 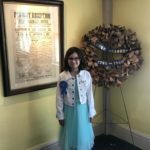 We are very proud to acknowledge Lyla Carbone for receiving 1st place in this essay contest. A highlight from her essay focused on how a simple smile can change somebody’s day. What a great way to begin to promote positive change in the world! We are proud of Lyla and all of the third grade students who participated in this annual event.